Many owners go crazy buying dog supplies. In the beginning it's best to focus on the essentials rather than spending money on dog supplies that you don't need. There are a few things that are absolutely “must haves” before you bring your Pug home. These are all relatively inexpensive. A dog collar is absolutely essential for your Pug. Even if it’s just for attaching their identification, your Pug should have a collar. They come in many shapes and sizes. Nylon or leather will work. You should check the tightness frequently especially with a puppy. Pugs have a very sensitive throat area so, again, check on the tightness frequently. Our advice would be to avoid the metal collars because to the Pug’s throat sensitivity. One option to consider is the harness. Pugs are susceptible to breathing problems so a harness may be a better choice. The harness goes around the Pug’s body so the neck is not constrained. Some Pugs can wiggle out of their collar. This is one of the reasons many owners choose a harness. Not every store that sells dog supplies will let you try on a collar or harness so try to find one that will. It's very important that your Pug is comfortable. Leashes are one of the most essential dog supplies. Leashes come in all shapes and sizes and are one of those items that we feel some people “over-think” in deciding which type to get. We like the nylon variety in the 6-8 feet length for your typical Pug walk. There are such things as professional leashes that are used in shows but we are talking about your every day run of the mill leash. Our vote is against the retractable leash. We feel a dog can get up to a high speed running in front of their owner and snap their neck back when they get to the maximum length. There are also instances where they have snapped back at the owner. Here is one vote for a “low tech” solution. Sometimes simpler is better. This is often overlooked in a list of dog supplies. It shouldn't be because it's extremely important. Your Pug should be properly identified. You should obey all the local registration requirements. Many places require a dog license with a number that is registered to you and your Pug. This number should be on a tag that attaches to the collar or harness. 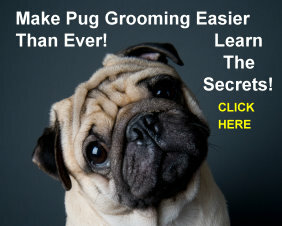 You want people to identify your Pug and to get in touch with you if they find your little friend. Pugs are curious animals. They love nothing better (except eating) than to be on a brisk walk. Unfortunately this does not have to be with their owner! When Pugs get away they are not the easiest breed to get back. Some Pugs never respond well to a “come” call by their owner whether it’s a specific command or their name. If they’re out on a walk they’re even more distracted so your chances of having your pug come back may not be good. Having a secure form of identification on your pug is one of the smartest things you can do. A pure bred Pug is an expensive dog. You want to protect your investment. The cost of a secure collar or harness and complete identification tags are insignificant compared to what you probably paid for your dog. Even more important, losing a dog can be a heartbreaking experience for both dog and owner. This is such a critical topic that some owners have gone as far tatooing their Pug as a means of permanently identifying them. Based on the cost of purebred Pug this may not be a bad idea. It’s why a new method, the microchip, has become very popular in recent years. A microchip is a very small device that is implanted into your Pug. Ask your veterinarian about the procedure. Amazingly enough many local authorities are fully equipped to scan your dog for a microchip. It has provided many Pug owners a greater sense of peace knowing their little treasure can be electronically scanned. The chip about the size of a grain of rice and the only caution is that you make sure whoever is doing the process is qualified to do it. It’s best to start with your vet rather than a pet store or a breeder. On that subject, don't be afraid to ask for a recommendation on where to get your dog supplies. Many times they will know of a source that you wouldn't have thought of. Price is not the only criteria to consider when you're buying dog supplies. Knowledge, experience and a willingness to help are all very important when you are looking for a source of dog supplies for your Pug. For sanitary reasons your dog should have their own set of food and water bowls. Any store that sells dog supplies will probably sell food bowls. Each Pug is different when it comes what they like or dislike. Some like large bowls and others like small ones. A bowl larger than 32 ounces is probably too large for your Pug. We like the stainless steel because they’re not breakable and they are the easiest to keep bacteria free. Plastic bowls get little nicks in them and bacteria can form in them so you need to take extra care in cleaning them. Ceramic bowls are fine but they break. Many Pugs do better with a slightly elevated bowl so that is something to keep in mind as well. Some people feel the elevation aids in the digestive process. Pugs should have something to chew on. It should be something that is designed for that purpose. Your Pug likes to play so it’s a good idea to find a few toys that he likes. Go slowly here. There is definitely no shortage of toys for your dog. Any store that sells dog supplies will usually have a selection of toys. Don't overdo it. Buy one or two different types and start to see what his preferences are. A Pug usually develops a favorite and keeps going back to like an old friend. They don’t have to be expensive for your Pug to take a liking to it. The toys should be appropriate in size for your dog and should be safe for him. If they have little piece that can be bitten off and swallowed stay away from them and if they have any kind of paint that can chip off avoid that as well. Common sense should be a guide here. A Pug, just like a child, can have too many toys. You might be surpised to see that listed here under dog supplies but for your Pug it's an absolute requirement. We mentioned before that the primary purpose of living for a Pug is to be a companion to their owner. Make sure someone will be home a majority of the time for your Pug. It’s not fair to have him home by himself and even more unfair to keep him in a cage. If no one can look on him during the day you should consider whether you should be getting a Pug at all. This sounds harsh. But these are a very cute and special breed who love to be with people. They like being with people even more than being with other dogs! Even if they’re Pugs! Your Pug loves you and wants to please you more than anything else. Okay, maybe they like eating just a little bit more than pleasing you but, rest assured, you are the primary object of their affection. They will follow you around where ever you go and never tire of your company as long as you give back affection in return. We’re not sure if any other breed beats a Pug for companionship. We think they win this contest easily. This raises the question for many people about traveling. Should you travel with your Pug rather than put him in a kennel? We have a separate section on travel and we include some information on what to look for in a kennel. It’s important to keep what’s best for your Pug in mind when making decisions. A lot will depend on the age and the health of your Pug but, generally, they like to travel with “their people”. After all, more than anything else, they want to be your friend!